The Product: The BBQ Tofu hand pies were a big hit. The Chocolate Chess Tartlets were compared on multiple occasions to Angus Barn's (which I have not tried as yet, but is ranked as one of the best desserts in the country?). The Chocolate Babka, as usual, gained more adherents to its chocolatey ways. The Crew: Big ups to Chef Matt, RML, JW, SZ, RG, and Ali R. Chef Matt, your hand pies are so awesome, not only do we sell out every week, but one of our cafe customers wants to make it a regular menu item throughout the week due to its popularity. Our Awesome Customers: Belinda, Otis, Tiffany, Jonah & Susan & Joel & Mike, HM, JD, DH+1, Ashley C., Ben & Walter & Linda. Extra props to giveaway winner Ashley C. for commuting by bike and bus from Carrboro to pick up her babka. South Durham Farmer's Market: This week, I finally got to work the South Durham Farmer's Market (with SZ). Traffic was a little slow due to the end of the vacation season, but the vibe was good...all the vendors were extremely nice, many bartered with me, and the patrons were impressed by the novelty and quality of our goods. 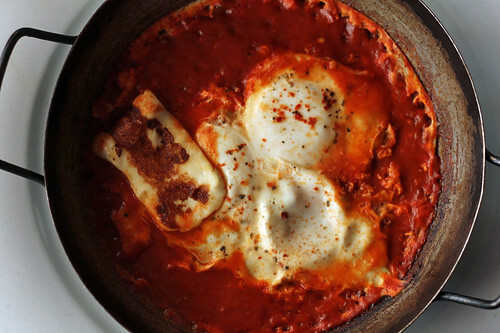 Recipe of the Week: Shakshuka (photo via David Leibovitz) made with bartered tomatoes from Maple Spring Gardens, Lil' Farm, and Piedmont Biofarm. The key here is to simmer down your tomatoes and sauteed onions until it is quite thick, else you get poached eggs in tomato soup. Here are some proportions to get you started.